The exhibition "And the Work of Our Hands" was curated by Und. Athens's founding editor Kiriakos Spirou with the concept of visualising time and labour through the works of five young Greek artists. Athens-based art writer Eric David visited the show and unpacks its concepts through an analysis of the works and their impact on the viewer. 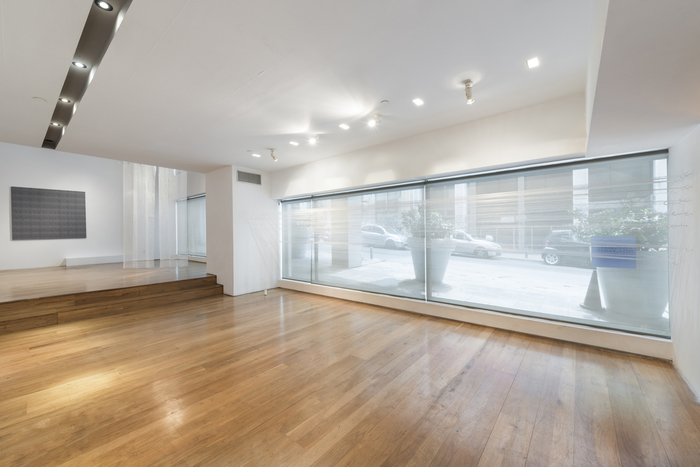 The ArtWall Project Space is listed in the Directory of Und. Athens (No.3) and is also part of Route 0 on the map. In the digital era we live in, where a simple click or tap is enough to grant you access to an infinity of artistic endeavours, we tend to forget the laborious work that creating a work of art entails. Cue in “And the Work of Our Hands”, an exhibition of five young Greek artists whose work is a product of painstakingly repetitious and mind-numbingly time-consuming labour. 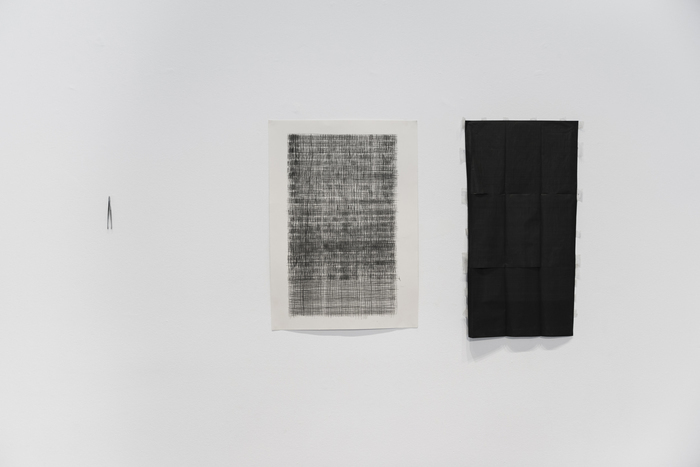 In fact, it was the distinction between those two concepts, labour and work—theorised by philosopher Hanna Arendt’s book in The Human Condition (“the labour of our bodies and the work of our hands”)—which inspired curator Kiriakos Spirou to set up what amounts to a conceptual installation about repetition, handicraft and asceticism. Hosted by the ArtWall Project Space in Athens, the exhibition reveals the formidable amount of time and effort that goes into creating art, not as a grand statement but as something that the visitors have to discover on their own by spending some of modernity’s most precious commodity, time. 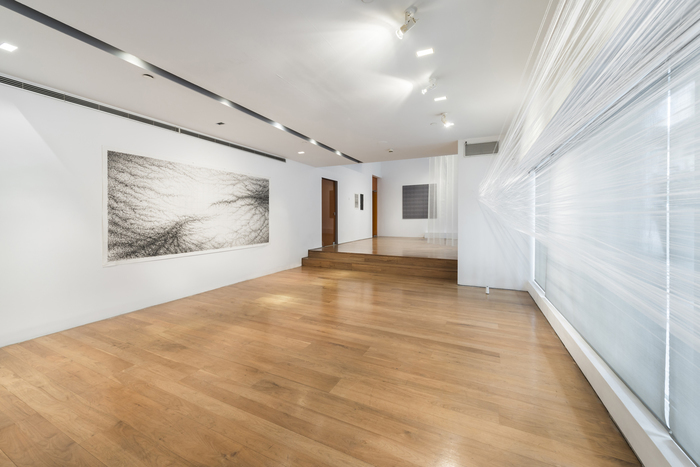 Catching the eye as you enter the gallery space, Panos Famelis’ three meter wide ink drawing, ALMOST (2015), encapsulates the conceptual underpinnings of the works on display. 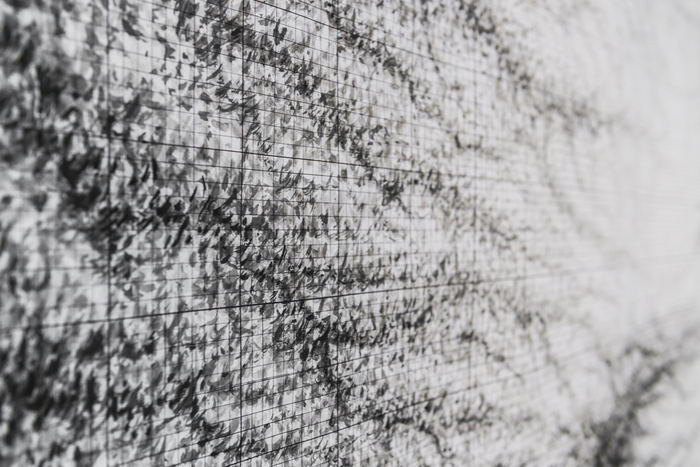 Combining a pen-drawn grid and a pointillistic frenzy of ink flutters, the drawing is a fit of asceticism whereby the individual gesture of dabbing the brush onto the paper is infinitely repeated, shedding signification and intent, and becoming instead an unconscious process akin, even synchronised, to breathing. The resulting image seems to reflect this organic connection by resembling, from a distance, the trachea branching into the lung or clusters of veins branching out through the body. Interestingly, apart from this microscopic viewpoint, the image can also be interpreted macroscopically as a depiction of stellar nebulae or dark matter. This conflicting duality of the micro- and macrocosm is something that pervades all the selected works. Although they are the products of a tremendous amount of small gestures, they are much more than the sum of their parts, a discrepancy that becomes evident as the viewer adjusts his proximity to the artworks. 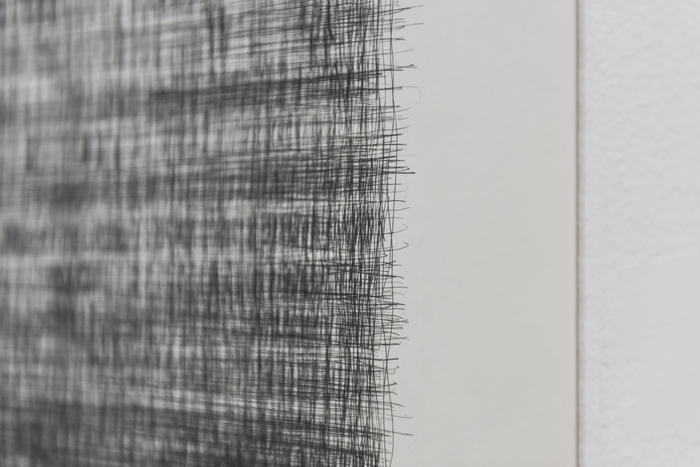 From a distance, the individual gestures—be they a brushstroke, an etched line, a perforation, a displayed nail or a woven thread—merge into each other and become invisible. 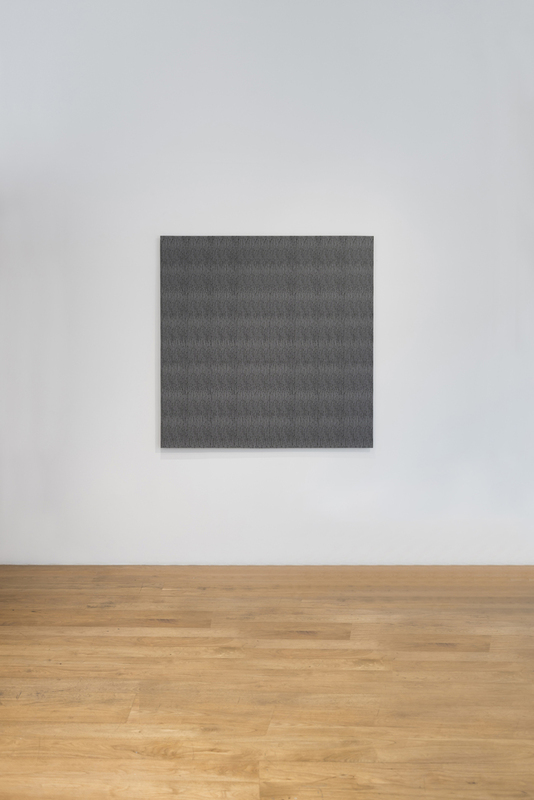 As the viewer moves closer and constituent units come into focus, the initial appearance dissolves and the true, laborious nature of the piece becomes apparent. To take the organic simile a step further, it’s as if one gets the chance to finally observe his skin under a microscope where the smooth epidermis is broken down into individual cells. 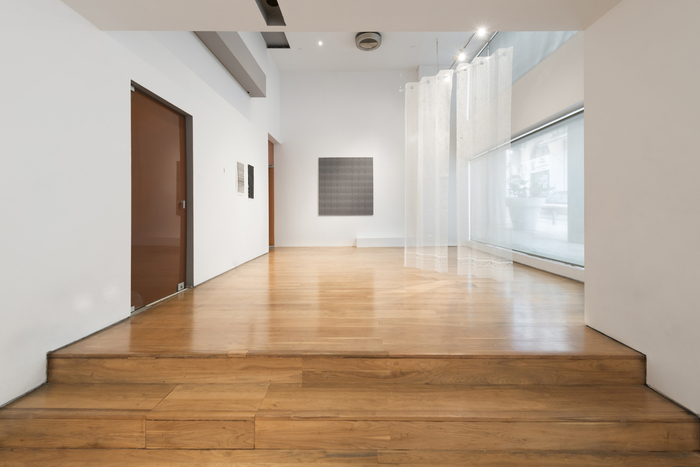 The fact that only one piece of each artist has been selected for the exhibition—the exception being Famelis, whose second piece, an installation of wooden spikes that he glued one by one in a ceiling recess, is not as prominently displayed as the rest of the exhibits—serves well Spirou’s intention to transform the gallery into a place of reflection, with each piece given ample space to breath both spatially and conceptually in an environment of minimal visual clutter. But more than that, their singularity also intensifies their preciousness as unique objects that demanded wholehearted dedication from the artists. In this sense, each artwork is to its artist what the rock was to Sisyphus, the source of arduous and repetitive labour. The exhibition’s sparseness also allows the pieces to converse with each other, their placement being the result of a meticulously choreographed stage direction. 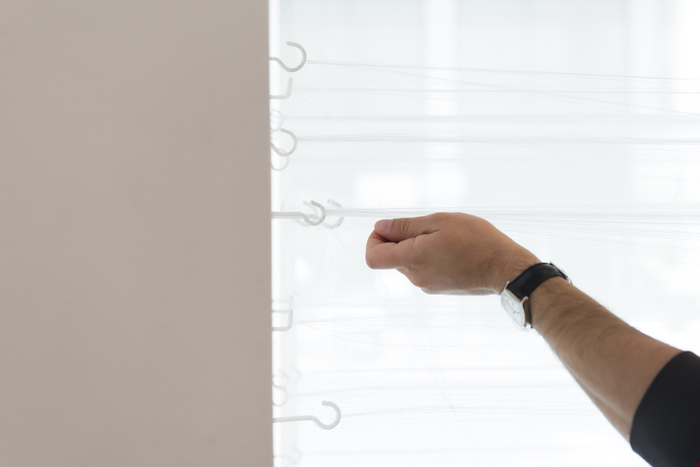 Thus Famelis’s long drawing is complemented on the opposite side by the six-meter-long thread installation by Panagiotis Voulgaris, Monument to the Engaged Touches (2017), whose horizontal stretches of white thread antagonise Famelis’s black grid lines. 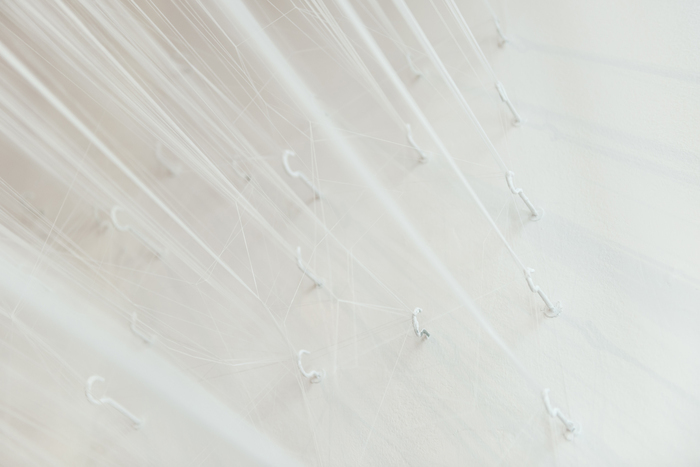 Conceived as a written gesture in space and woven from a single silk thread measuring nine thousand meters in length, Voulgaris’s installation required the artist to pace up and down the length of the installation countless times, a laborious process that the work’s ethereal lightness deceptively hides. This is another attribute that all the selected works share, an illusory effortlessness that conceals incredible effort, akin to the way we consume ever greater amounts of products and content at an ever-faster pace. Moving further into the gallery, Maria Mavropoulou’s composite photograph draws you in with its condensed visual power like a black hole. 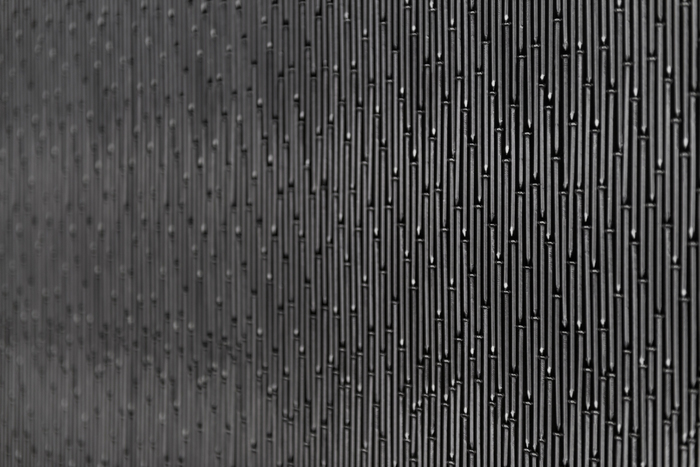 Part of her series Geometries of Chaos (2014), the piece is a product of long hours of digital labour, seamlessly multiplying a photograph of a vertical arrangement of nails on a black background. As with other works, proximity is key in its visual appreciation. From a distance the image features a textured pattern of greys from which mesmerising patterns and shapes slowly emerge as you come closer. Once up close, the revelation that its constituent units are nails is both surprising and satisfying. In conversation with Mavropoulou’s photograph, Vasilis Botoulas’s paper drawing shares the same language of visual compression, dark tones and Cartesian logic. 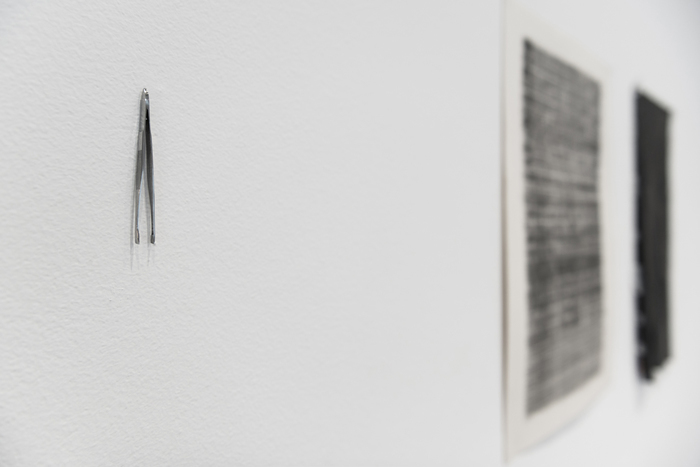 Its accompanying items, a piece of carbon paper and a pair of tweezers hung on either side of the drawing, give visitors a clue about the artist’s technique. 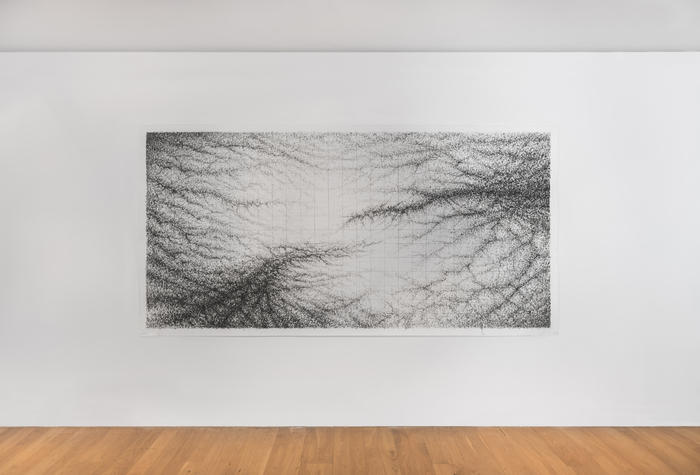 Blindly etching thousands of horizontal, vertical and diagonal lines onto the carbon paper, Botoulas has produced a drawing through a subliminal process of instinct and automation, similar to Famelis. 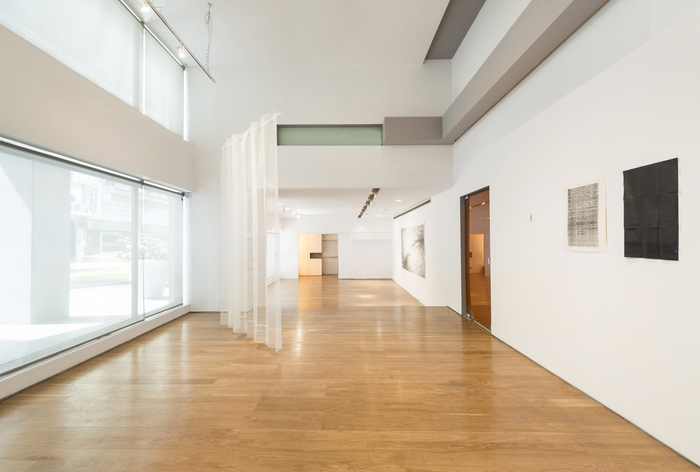 Overlooking Mavropoulou’s and Botoulas’s contributions is Stratis Tavlaridis’s pair of painstakingly perforated, paper curtains (Curtains, 2014), whose lightness seems to be the yang to the other two pieces’ yin. 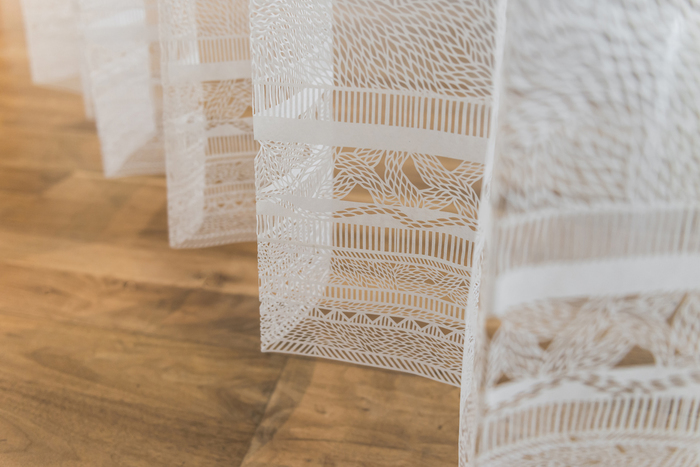 Inspired by the traditional Greek lace handiwork that dates back to the 15th century, Tavlaridis reverses the age-old technique whereby the finished piece is a product of synthesis—looping, twisting, or braiding thread together to create the lace—into a process of subtraction and de-materialisation. 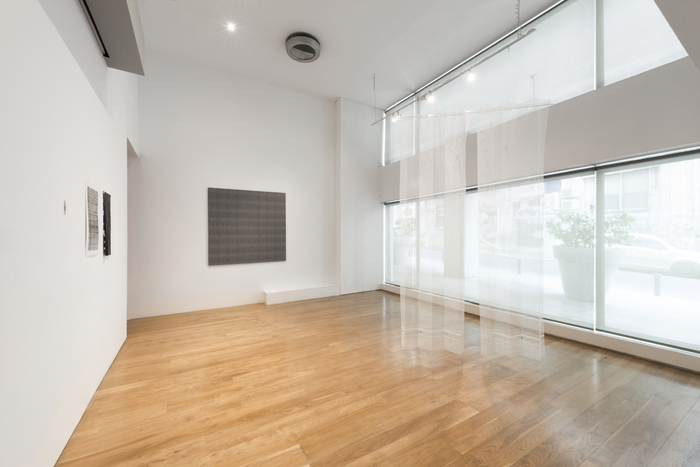 Suspended and thus free to sway in the gallery space, the 2.4-meter-high, all-white, meshed drapes appear as the antithesis of the stern darkness of Mavropoulou’s and Vasilis Botoulas’s work, yet if one spends some time observing the works, the illusory patterns dizzyingly emerging from the latter two seem not that different from the swaying embroidery of the former. The mind-blowing detailing of the cut-outs that Tavlaridis has spent immeasurable amounts of time executing in isolation, appropriately echo Chechov's advice that “the only way we can redeem our past is by suffering and by giving ourselves over to exceptional labour, to steadfast and endless labour”. The exhibition And the Work of Our Hands was presented at The Artwall Project Space in Athens, on the ground floor of Fresh Hotel, from 05 to 29 April 2017. Participating artists: Vasilis Botoulas, Panos Famelis, Maria Mavropoulou, Stratis Tavlaridis, Panagiotis Voulgaris. The work Curtains by Stratis Tavlaridis is courtesy of CAN Christina Androulidaki Gallery. The work ALMOST by Panos Famelis is courtesy Ileana Tounta Contemporary Art. A catalogue for the exhibition was published by Kiriakos Spirou in a limited edition of 60 copies.